Shari Thompson is a stay-at-home mother to three boys. When their first child was born, she and her husband Tom weighed the pros and cons of Shari returning to work after maternity leave. “We finally decided family was just more important,” Thompson says. She left her career in corporate America to stay home full time. But the transition to one income wasn’t easy. She was saving the family money by cutting the cost of her commute, weekday meals and new clothes for work, but Shari worried she wasn’t pulling her weight. They sold one car, and Shari even went through everything they owned to sell the old clothes, trinkets and electronics they weren’t using. Twelve years and two more children later, the couple has settled into a lifestyle that fits. They’ve learned to work within Tom’s salary and keep their family happy and healthy on a budget. “I can get most of our groceries for the month totally free,” says Thompson. Don’t believe it? Neither did we. So we asked her to reveal her tricks. We asked Thompson to walk us through a typical trip to the grocery store for her family of five. It may be most convenient to make one stop for everything you need, but you’ll save more money by shopping around. “Check store flyers for sales and PriceGrabber.com for the lowest prices,” she advises. “I’m subscribed to literally every coupon site,” Thompson admits. You can often stack coupons from the store or manufacturer with local sales. One of Thompson’s favorite grocery-shopping hacks is to carry a basket. Even though she’s shopping for a big family, a cart is too big. “It just encourages you to buy more than you need,” she explains. Plus, Shari points out, you can move a lot faster through the store with a smaller load. In addition to sticking to a small basket, Thompson only shops for lightweight food items. Think bread, bagged salads, marshmallows and some varieties of cookies. “Meat, milk, eggs — those things just slow you down,” she says. One place Thompson is willing to add a little weight, though, is in her clothing. When I asked her if anyone ever notices the items stashed in her pockets, she explained people expect cargo pants to be hideously bulky, so they never question it. Stick with smart tennis shoes, she says. You’ll need them for your final sprint to the door. The key to Thompson’s savings is getting into the car and out of the parking lot before the manager can read your plates. When I finally swallowed my pride and asked for help, things went much smoother. That’s when the savings really started to add up. When he’s available, Tom will wait in the van in the lot while Shari shops. “The remote door opener is a godsend!” she says. On occasion, she’ll ask neighbors for assistance — in exchange for a bag of free groceries. In a pinch, Thompson will put her oldest son, 12-year-old Damien, behind the wheel. “It’s so important to teach kids the value of money early on,” she explains. 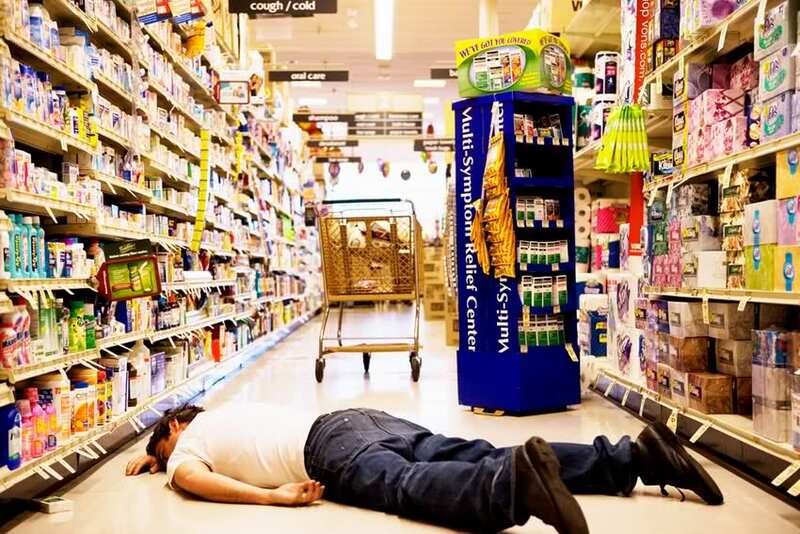 Never get in the way of an extreme grocery shopper. After a close call with store management last year, she bought a pair of old boxing gloves at the thrift store for just $2. She keeps them under the driver’s seat to fend off ruthless employees. It’s not a perfect system, Thompson admits. She has to pay for a grocery haul every few months to keep under the radar. Also, the family has to move a lot. But these eight simple steps have helped Thompson knock her family’s food expenses down to almost zero, for which she’s thankful every day. 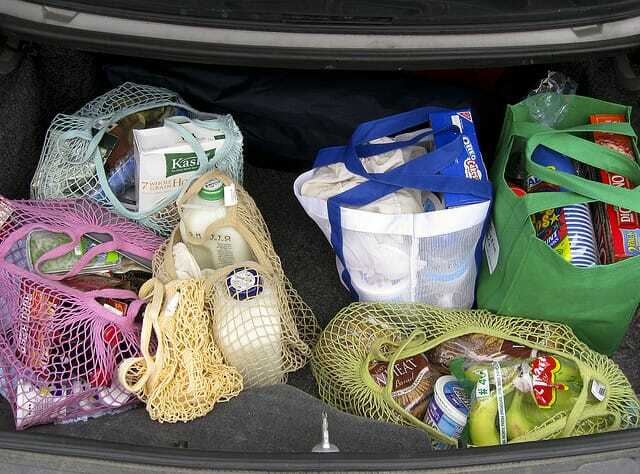 Your Turn: How much is your monthly grocery bill? Will your family ever be as good as the Thompsons? Our lawyers would like to remind you that it’s April 1.